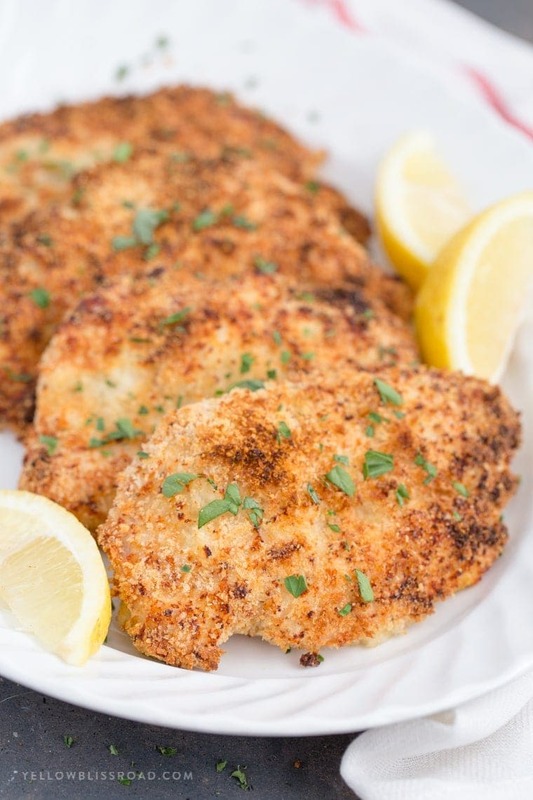 Get dinner on the table quick with my Crispy Garlic Parmesan Baked Chicken! It’s crunchy and packed with flavor and it’s perfect for satisfying your pickiest critics on busy weeknights. 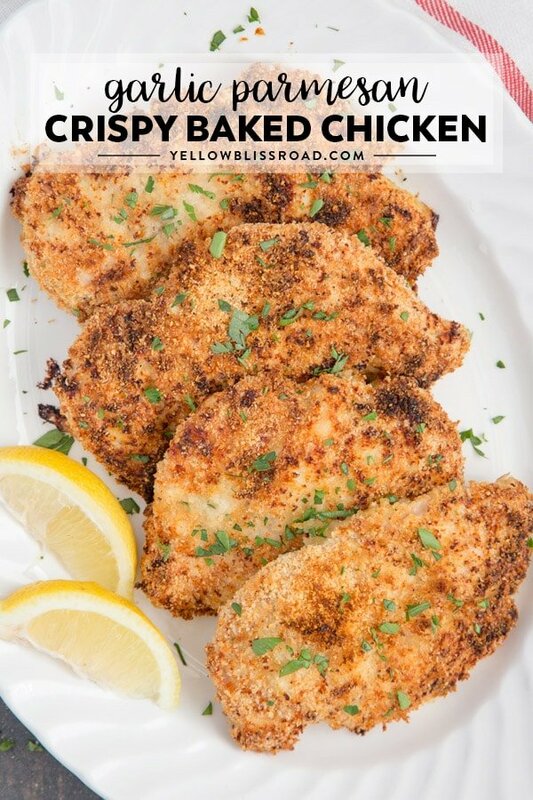 We love this Crispy Baked Chicken any night of the week, especially served with Easy Instant Pot Mashed Potatoes and Olive Garden Salad. I grew up on fried chicken. My grandma always loved it – she liked quite a few things breaded and fried, but especially chicken. It’s always been a favorite of mine too. She prepared it in the classic fashion which was a flour dip, then eggs, then breadcrumbs. 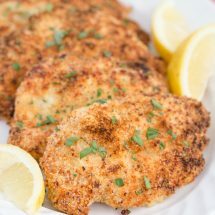 That’s my preferred method too, but I like to add some extra flavor, like with this Crispy Garlic Parmesan Baked Chicken. Plus, it’s baked in the oven and not fried, eliminating all of that unhealthy grease. Instead of just plain breadcrumbs, they are mixed with fresh and finely shredded Parmesan cheese (lots of it!) and garlic powder. 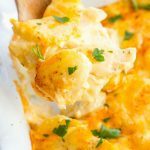 The sharpness and saltiness from the cheese and the fragrant garlic give this baked chicken just the extra flavor punch it needs. A little tip when oven “frying” chicken like this, spray the tops with nonstick cooking spray to give them that nice golden color. You can also broil them during the last several minutes. I actually do both! If you’re looking to make it just a little bit lighter, here’s a great tip for you: only bread one side of the chicken! It’s how I lightened up my favorite Chicken Parmesan recipe, and I use it any time I want to cut back a few calories. You’ll never even know the difference because you still have that golden crispy breading all over the top of the chicken. Preheat your oven to 375 degrees and cover a baking sheet with foil or parchment paper. Prepare the breading station with three shallow dishes, filled with seasoned flour in one, whisked eggs in a another, and panko breadcrumbs with Parmesan cheese in a third. Pat boneless, skinless chicken breasts dry before dredging through the flour, then the eggs, then the breadcrumbs. 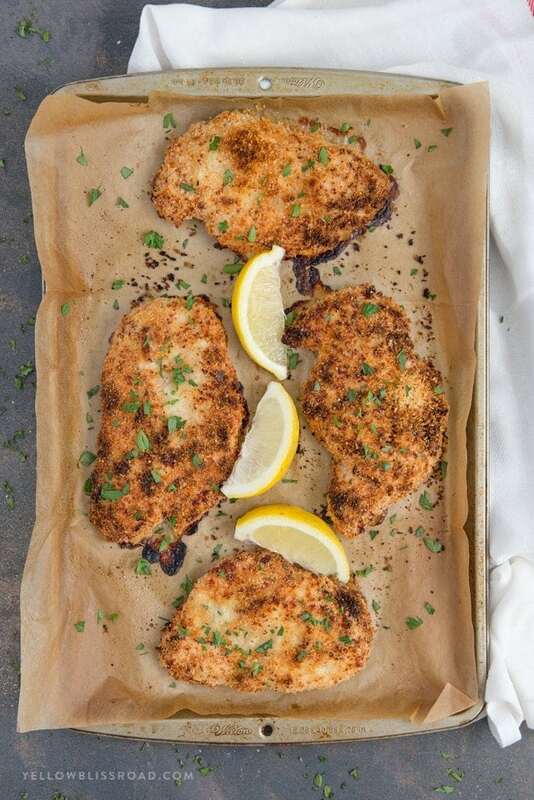 Arrange breaded chicken on the prepared baking sheet and spray the tops of chicken with nonstick cooking spray. 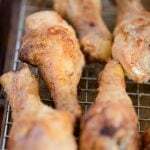 Bake chicken at 375 degrees for 35-40 minutes or until crispy. My entire family gobbled this chicken down in minutes. I served them with some lemon wedges which really add brightness to this dish. Bacon Ranch Chicken Pasta Salad – I really love using crispy chicken in this pasta salad. It provides such a great crunch. Bacon Avocado Chicken Salad with Lemon Vinaigrette – Slice up leftover and save yourself having to cook up any extra chicken for this delicious salad. Homemade Alfredo Sauce with Fettuccine is another great base for extra crispy baked garlic parmesan chicken. 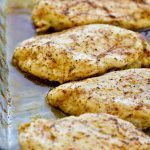 Leftover crispy chicken is also delicious in sandwiches, salads and wraps, and it makes a fantastic protein to add to your kids’ school lunches. 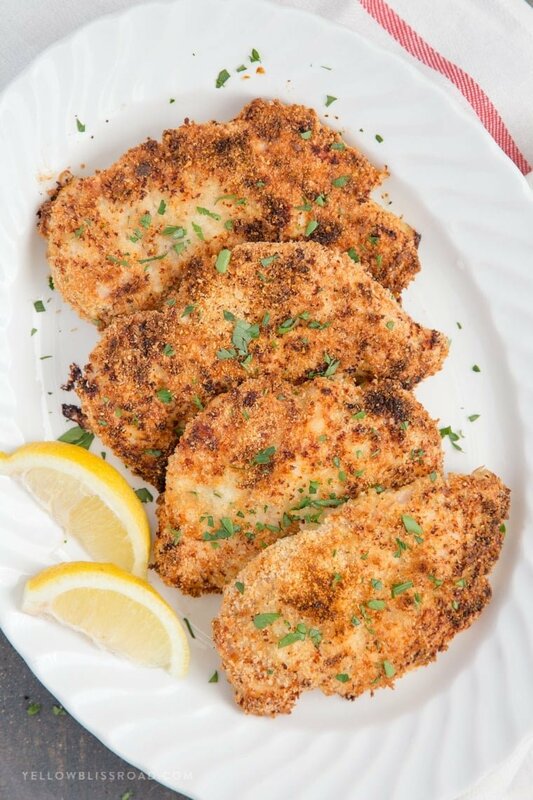 Get dinner on the table is a jiffy with my Crispy Garlic Parmesan Baked Chicken! It's crunchy and packed with flavor and it's perfect for satisfying your pickiest critics on busy weeknights. Preheat oven to 375 degrees. Cover a baking sheet with foil or parchment paper. 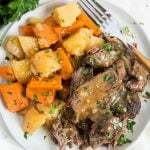 In a shallow dish, combine flour, black pepper, salt, garlic powder and Italian seasoning. 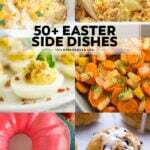 In another shallow dish, whisk together eggs and milk. In a third shallow dish, combine panko breadcrumbs and Parmesan cheese. Set up assembly line to coat chicken in this order: flour, eggs, panko. First dredge chicken in the flour mixture, then in the eggs and then coat with the panko/Parmesan mixture. Once coated, arrange on the prepared baking sheet. Spray tops of chicken with nonstick cooking spray. Bake for 35-40 minutes or until crispy and golden brown and cooked through. If the tops aren't brown enough for your taste, flip on the broiler for a few minutes; careful not to let them burn. Garnish with fresh chopped parsley and serve with lemon wedges. To fry: In a large heavy-bottomed skillet, heat a high-temperature oil like canola or corn oil over medium heat. Place chicken in the hot oil and fry until golden; about 4 minutes per side. Careful not to keep the oil too hot or the chicken will burn. 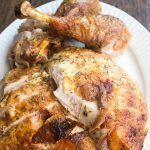 Chicken is done when juices run clear or it reaches an internal temperature of 165 degrees F.
I used this recipe tonight and it was delish! So quick and easy. Thanks! I made a lemon white wine sauce for this, so good. 1 Cup low sodium chicken broth reduced to 1/2 the juice of one lemon and a 1/2 cup of white wine. Added and reduced down again by 1/2. drizzle over the chicken. I follow a low fat diet, after I took my sauce I added 1 tab. spoon butter and stir, that was how I finished my husband sauce. Nice! I love that you were able to make it work for you! I fixed this dish for my husband and I today for dinner and it is so good! Definitely a keeper. Can I use the “thin cut” chicken breasts that stores sell for this? Yex, that’s what I used (cutlets). Going to try this chicken recipe tonight. It looks delicious. 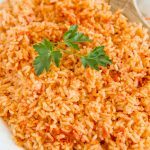 What is the nutritional values? Is this Keto friendly? My fiancé and I made this for dinner the other night. We loved it! 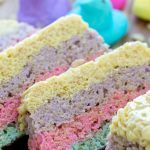 Super simple and super delicious!